oh, and first, this is great craft for kids OR adults. Maybe it's a project that you can do together. Think of it as mommy and me time. On Sunday my little Bug came and asked if she could use some of my tissue paper. 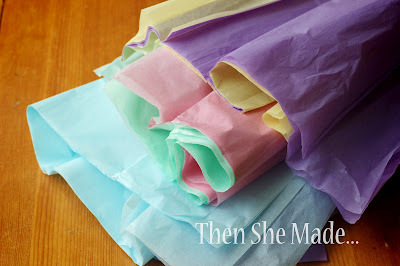 My precious tissue paper. It cost me a $1 for a huge multi color pack so I figured she could go crazy and I wouldn't be out much. I didn't even ask her what it was for which is unusual for me. 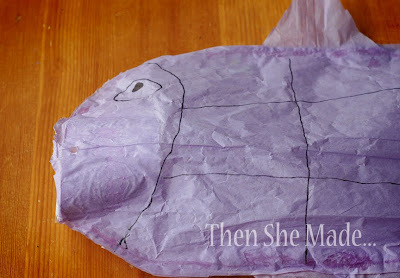 You know, you gotta keep tabs on kids crafting or you just may end up with tissue paper walls or car seat covers. Ok, maybe not to that extreme but we've had some pretty interesting craft creations in our house before so I'm usually cautious. She took the tissue pack and quietly worked away. Occasionally I'd hear, where's the glue? or I can't find the string! But other than that, she was totally on her own. So, here's what she did. Step 1: She took two sheets of purple tissue paper and cut out two long ovals. 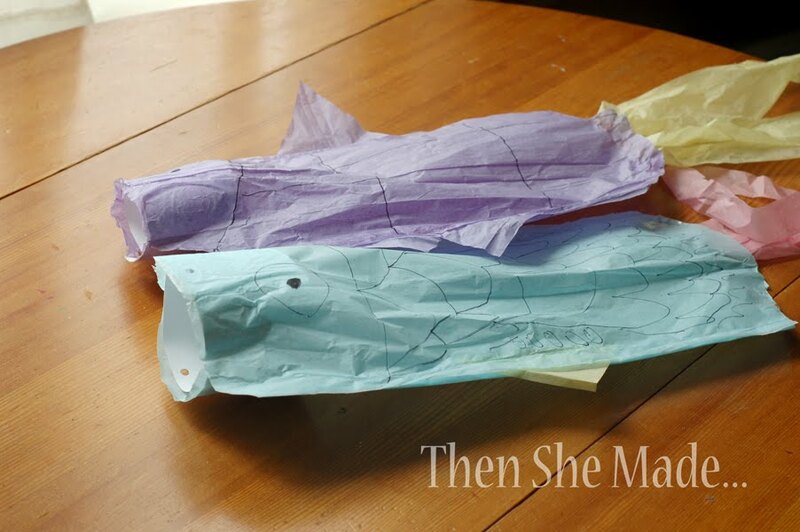 Then she cut out three fins. Step 2: With a black sharpie marker she drew on some designs and an eye on one side of each side piece of tissue. 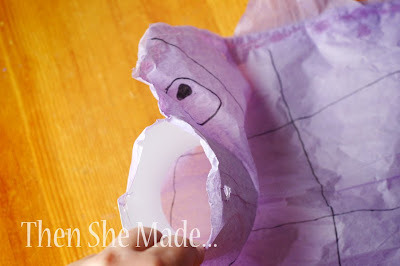 Step 3: Then she used white Elmer's glue and glued the fins to one of the ovals. and then glued the top, only the top, of the two pieces together. Think of it as gluing it from the top of the mouth all along the edge to the top of the tail. 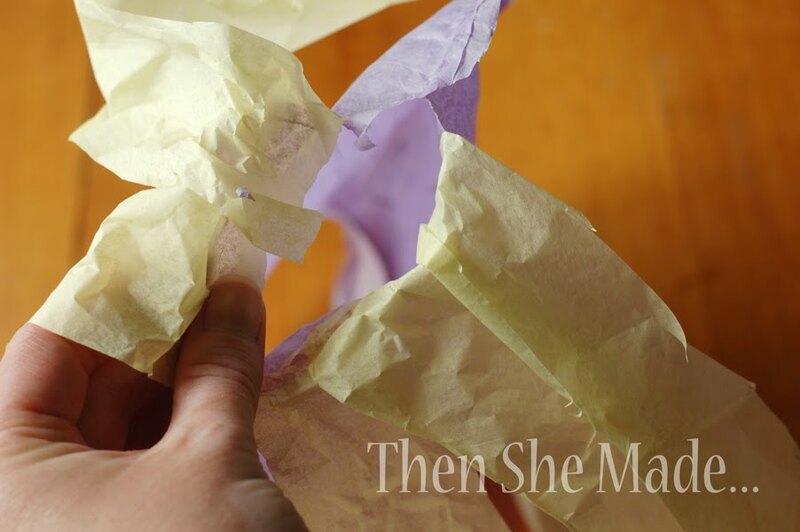 Step 4: Next she took a piece of white cardstock and cut it into a long strip and turned it into a circle. She then glued the circle to the tissue paper in place where the mouth goes. I'm not sure if you can tell for the picture or not but think of it as a fish with it's mouth open. Step 5: Next she cut 6 long strips of yellow tissue and then glued three strips to each side of the opening where the tail goes. Step 6: Next she glued the bottom part of it together. So, from the bottom of the mouth all along the bottom edge to the bottom of where the tail goes. Does that make sense? You need to keep the mouth open and the tail part open. The wind needs to be able to go in and out of the windsock. Bug's twin sister thought it was cute too so she made one in blue and pink. Step 7: Poke a hole on each side of the mouth. Make sure it pokes through the cardstock. 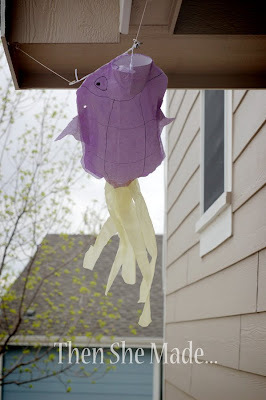 Then thread a string through the holes and then hang up your windsock outside. We hung hers on our porch. Step 8: Wait for the wind to blow and smile at how fun it is to watch it dance in the wind. 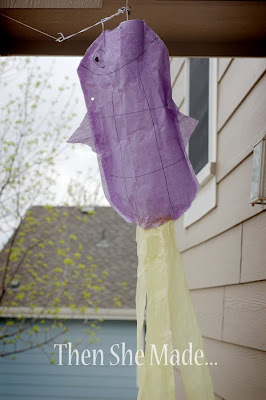 Note: I was really doubtful that tissue paper was the right thing for a windsock. It seems like it would rip easy in the wind. However, we've had some windy days and so far so good. With the opening in the mouth and the tail, the wind fills it up but then passes through so there is very little pressure on the tissue paper. It's holding up just fine. So there you have it a fun little craft brought to you by a cute little 10 year old. DD9 is collecting paper towels and toilet paper tubes. 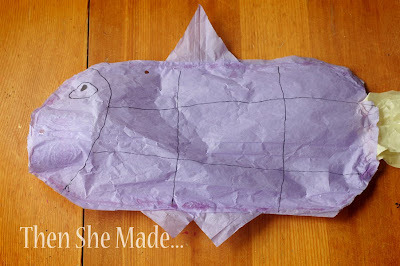 Those would probably work as the digestive track from mouth to end of the fish project, don't you think?? @Tereza, absolutely! I think that would work great for the mouth. Good idea!